In the animal alphabet theme, I have designed the letters with a corresponding animal, for example A is for Alligator. Name prints are available in two sizes, depending on the length of the name, and come mounted and framed, as shown below. See information section right for delivery times and more detailed information on the name prints and posters. 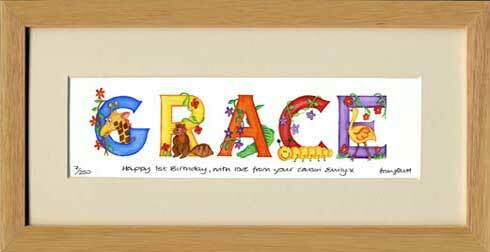 These name prints make fabulous gifts and keepsakes as children of all ages love seeing their names captured in these illustrated designs. You can make them even more unique by adding a special handwritten message to mark a special occasion or note a baby’s date of birth and weight. ..the parcel arrived- it’s absolutely gorgeous, once again, and my in-laws were absolutely thrilled. It’s such an original gift, and one the baby will be able to keep forever. Thank you so much for your brilliant customer service and your amazing skill. I’m sure I’ll be back soon.